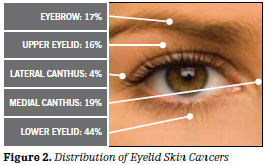 Skin cancer often involves the skin of the eyelid (most commonly the lower eyelid) or adjacent face; however, it might be found anywhere on the eyelid margins, corners of the eye, eyebrow skin, or adjacent areas of the face. Usually, they appear as painless elevations or nodules. Occasionally, the eyelashes are distorted or missing. There might be ulcerations of the involved area, along with bleeding, crusting, and/or distortion of the normal skin structure. Such findings need to be evaluated and might require a biopsy to confirm the diagnosis of skin cancer. Skin cancer might appear as painless elevations or nodules. Occasionally, the eyelashes are distorted or missing. There might be ulcerations of the involved area, along with bleeding, crusting, and/or distortion of the normal skin structure. Fair-skinned individuals develop skin cancers more commonly than dark-skinned. Sebaceous gland carcinoma and malignant melanoma are more serious forms of skin cancer because they might spread (metastasize) to other parts of the body. These types of skin cancer require prompt, aggressive treatment because of the threat of early spread. SPF: Sun Protection Factor describes the increased allowable time of sun exposure before your particular skin type burns. For example, SPF4 means you are might exposure yourself to the sun four times longer without burning.